Best Western Burns Hotel ,18-26 Barkston Gardens, Kensington, London, SW5 OEN, United Kingdom. The Best Western Burns Hotel in London is a Grade II listed building, situated in a beautiful and peaceful Victorian garden square in Kensington. This excellent London hotel is very close to Earls Court and Olympia exhibition centres. We are close to Kensington High Street and Knightsbridge with their highly fashionable shops and restaurants and a short walk to Kensington Palace, The Royal Albert Hall and the museums of South Kensington. With excellent facilities, this great value hotel in London is perfect for your stay. The location of this hotel is ideal for business visitors and travellers alike. For those of you wanting to go further into the West End or going to 'theatre-land' Earl's Court underground station is just 2 minutes walk and that will have you in the West End in no time at all. The hotel has easy transport links to Heathrow Airport. So whether for business or pleasure, the Best Western Burns Hotel offers a high standard of accommodation at affordable rates combined with friendly and efficient service. 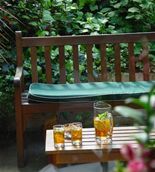 Relax in the private walled garden with a drink from the Ellen Terry Bar or dine in the patio restaurant. Television with satelite channels, telephone with internet dial-up, high speed internet access (wifi), Hairdryer, writing desk, trouserpress, tea & coffee making facilities and complimentary toiletries. Laptop size personal safes have been recently been installed in all rooms. Please note that all bedrooms are non-smoking. NEW: FREE High Speed wireless internet access in bedrooms & public areas! Our Triple rooms have a Double and one Single bed. For families travelling with a child under 2 years we are happy to offer a babycot (crib) and bottle warmer in the parents room, free of charge. To make travelling with your family easier please contact us to discuss your requirements. Why not book one of our kingsize rooms or a deluxe suites. Our deluxe suites are uniquely decorated with luxury bathrooms. To make your stay extra special why not combine it with one of our special packages available throughout the year. Booking on-line available. Start the day with our extensive Continental Breakfast Buffet or a traditional English Breakfast cooked to order. Breakfast is served from 7am to 10.00am Mondays to Fridays and from 7.30am to 11am at weekends. Prefer to have your breakfast in bed? Room Service Breakfast is available during breakfast opening hours. Open to residents all day the Ellen Terry Bar is the perfect place to unwind and relax after a busy day. The wood panelled bar offers a cosy environment is named after Dame Ellen Terry, one of the leading ladies of the Victorian stage, who lived in the building from 1847 - 1928. On sunny days our walled patio garden you can enjoy your drinks and food "al fresco" . Refreshements and snacks are available throughout the day. Our extensive and very popular Bar Snack Menu is available daily from 5.30pm to 9.30pm. We have a selection of "Lite Bites" and drinks on offer 24 hours a day. In addition to this we are happy to serve items from the Bar Menu to your room, from 5.30pm - 9.30pm. We are here to assist you 24 hours a day. Please note that our check in time is from 2pm and check out time 11am. For guest arriving earlier or wishing to stay later we will try to arrange a room if possible. You may store our luggage with us free of charge while you are waiting to check in or up until 11pm on the day of your departure. Our Reception team will be happy to arrange taxis, theatre tickets and sightseeing tours. We are also able to arrange for you to be picked up from the airport by private taxi. Please contact us with your flight details at least 24 hours prior to your arrival. Discounted membership for hotel guest is available for £7 per day and includes full use of all gym facilties, excercise classes and sauna.Tickets are valid for multiple visits for that day and can be purchased from the Hotel Reception. Pay & display / meter parking is available on Barkston Gardens and several locations nearby. On-street parking is free of charge after 6.30pm & before 8.30am Monday to Saturday, free all day Sunday & Bank Holidays. Please ensure you are aware of parking restrictions before before you leave your car. For any guests wishing to leave their car for a longer period wish to use the NCP car park nearby (5 mins walk). Please contact us for more information. Orange Badge Holders: There are two disabled parking bays in Earls Court Road. Please contact us in advance for further information. Its central location with excellent transport links make the Best Western Burns Hotel the perfect base for any business trip. Our rooms are designed to anticipate the needs of today’s business traveller and offer facilities such as writing desk, internet access via modem link or high speed wireless access, telephone with voicemail, TV with satellite, hairdryer, trouserpress, iron & ironing board on request, dry cleaning service,24 hour room service. Business services such as photocopying and faxing are available at Reception 24 hours a day, where we are also happy to help with transport requirements, directions, parking information and luggage storage. The hotel’s bar and walled patio garden is the perfect venue to relax with friends or colleagues and enjoy light snacks and drinks throughout day. The Best Western Burns Hotel is within walking distance to Earls Court & Olympia Exhibition Centres. For many years we have been the prefered hotel for exhibitors from some of Earls Court's major shows. We understand that your time is valueable and are able to offer guests attending exhibitions early check ins and late check out whenever possible. For those of you on early starts we are happy to arrange an early breakfast.